Between the 3rd June to the 16th July we held our 27th Manparivartan Shibir. A total of 29 children attended from all different areas of the country. After the camp we managed to place the children in variety of safe locations whether it be back with their families, or in vocational training to give them some essential skills and increasing employability. All of the children attending are between the ages of 5 and 15, have been frequently leaving home, have an addiction to drugs or alcohol, or have been staying at the platform for over 3 months. 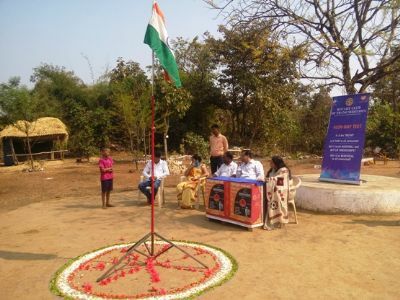 During this camp, the children developed their minds through music, sports and meditation. They also showcased their creative talents through art and fun night-time activities. During this time we were able to contact most of the parents of the children, inviting them to the shibir to be taken back home. The families also went through a counselling phase, whereby they were guided on how to get the most out of their child and keep themselves as a happy family, reducing the risk of a further runaway occurring. Over 1,000 of the general public also attended this samarop function and to see the amazing work that Samatol is completing. Through this, we are raising further awareness in the local society and so these people can help in making a bigger difference for these children. We are only able to function with the help and support we get from these well-wishers. During the send-off ceremony, the children were given a school bag which can help towards developing in education and attending school on a daily basis. This will also provide a reminder for the messages conveyed from attending the Manparivartan shibir. In the samarop, Sanjay Kelkar, MLA of Thane, was present as the chief guest. He gave a speech aimed at keeping families united. He also stressed about the importance of education for the child’s future, and reminded the parents that they are the future of Bharat. With this in mind, the kids were reunited with their families in an emotional celebration and as such their bonds grew stronger. Who knows, some of these kids could be future Prime Minister, or even better a future social worker aiming for the betterment of society.